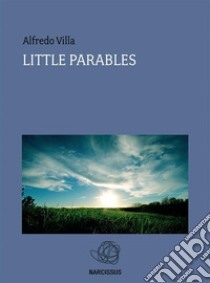 The title is in the diminutive form out of respect for the official definition of the word parable, and above all out of deference to those works which constitute the true and only real Parables. The 89 short stories which make up this manuscript do indeed respect that intent. Sitting in a Paradise where time runs simultaneously still, God lowers his gaze on to those ordinary events which have as their main characters all the animate and inanimate forms of creation. It is a multitude of points of dialogue between the earthly and the divine, where God – surprisingly human – discovers Himself to be able to learn from the results of his creative intention. Objects, plants and animals are presented in allegories of virtue and fault, all the while leaving the reader to discover where the story passes from the realm of the simple tale to that of becoming an opportunity for reflection. The language used is in the simple style of fairytales, with ample recourse to direct speech to give voice to the various characters rather than to an all-knowing narrator. If reading these “little parables” could generate even the slightest inkling of gratitude and love towards God, that would surely be a wonderful thing. I feel, in all honesty, that even a simple, tiny, and apparently insignificant gesture of affection, no more than the hint of a caress in God’s direction, would suffice for Him as our acceptance of the gift of His Mercy and His Salvation. We can receive all that was promised, which is so very much, in exchange for so little.